Franzi taking pruning weights at Tua Marina. Winter pruning is the stage in the grapevine’s annual growth cycle where the winegrower can determine the vine bud number and canopy structure that will combine to achieve the yield and quality targets at harvest in the following autumn. Choice of training system and pruning density has direct impact on bunch number and vine vigour and consequently on harvest brix and tonnage. The Viticulture Practice is able to work with the grower in achieving this target. The skilled pruners at The Viticulture Practice are able to prune to the growers precise specifications, laying down guaranteed bud numbers per vine or per metre row. Their experience and knowledge of vine physiology means that the best canes are selected for laying down, leading to balanced vines and the minimum of vine-to-vine variation. Bud counts and the measurement of prunning weights can be used to determine vine vigour and the requisite bud number to achive a balanced vine. The Viticulture Practice crew are familiar with all of the training systems in common use and they have experience with all the major grapevine varieties and are aware of each cultivar’s special requirements. Training system conversions and remedial pruning are also specialities. 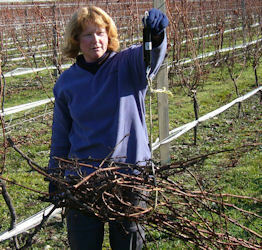 The Viticulture Practice also offers a training program for pruning staff. 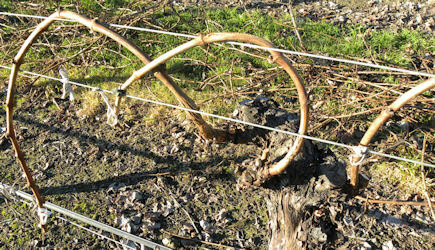 A qualified and experience tutor will visit the client vineyard and teach the fundementals of correct pruning. Click on the links below for Staff training tools. Pruning Tutorial 1: Training Systems. Pruning Tutorinal 2: Common pruning faults. Pruning Tutorial 3: Pruning fundementals. Arched canes at Traminer View Vineyard. 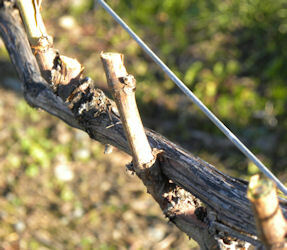 Spur pruning. 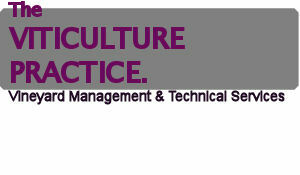 The Viticulture Practice Ltd.Marlborough, N.Z.ph 021 230 2340. email lexthomson@vitpractice.co.nz.